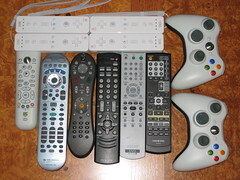 I am in dire need of a universal remote. Iâ€™ve got my eye on the Logitech Harmony 550â€¦ I feel like it has the best bang for the buck. Iâ€™m tempted by the Harmony thatâ€™s tailored for the Xbox 360, as itâ€™s basically the same for $10 less. My friend brought up a good point thoughtâ€¦ how long do I plan to use the Xbox? With the way the Harmonys are programmed from an online database, Iâ€™d hope that it could out-live a game console.